At 7 years old, your cats may not look or act much differently, but their nutritional needs have changed. For example, their digestive system is not as strong as it used to be, so their ability to absorb nutrients weaken. 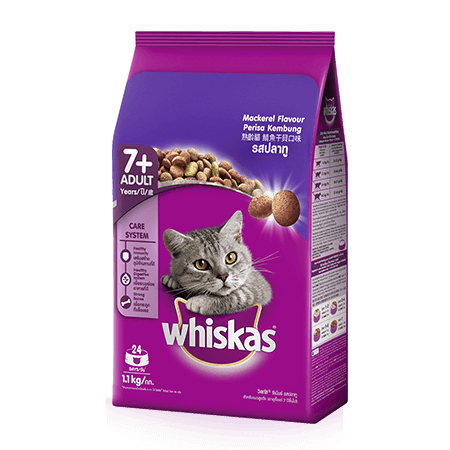 Help them transition to WHISKAS Adult 7+, specially formulated to postpone the effects of old age. -Food that is complete and balanced, with 41 essential nutrients. -Contains fibre to ease digestion and promote bowel health. -Enriched with calcium, phosphorus and vitamin D for healthy bones. Both WHISKAS dry and wet food are complete and balanced for your cat’s nutritional needs. However for maximum goodness, we encourage you tom provide both to your cat. Wet food contains water to ensure healthy urinary tracts, and has fewer calories. This is especially important for less active cats to prevent unhealthy weight gain. The unique kibble shape of WHISKAS dry food helps to clean teeth and gums, ensuring cat’s oral health. Your cat will surely adore the variety in texture and flavours that you provide to her.